You know your students live in a world of technology. So you know technology can help hold their attention. But you have a budget. 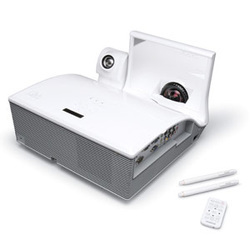 If your classrooms already have dry erase boards but do not have projectors, the MimioProjector interactive projector lets you bring interactive teaching into your classrooms without breaking the bank. • An affordable way to bring interactive technology into classrooms that don’t already have projectors. • Includes the MimioStudio™ classroom software that controls all MimioClassroom™ products. Makes it simple to create and deliver engaging lessons. • NEW: Up to ten pens may be used simultaneously by buying additional pens from Mimio.